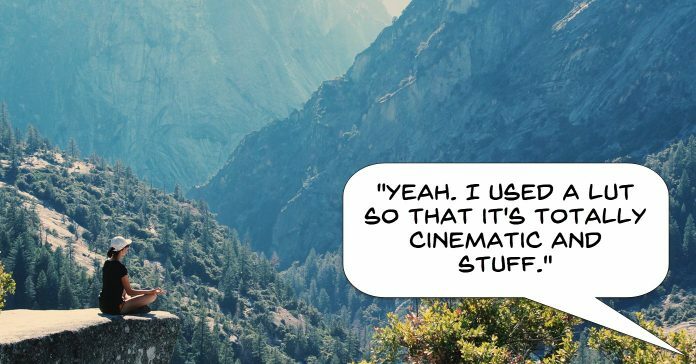 Once again this week I became embroiled in an online discussion involving the term “cinematic” and that user’s search to find some kind of shortcut to achieving that look. I kinda get a little annoyed by catchphrases like that which end up getting passed around and take on a life of their own. The term cinematic could be used to describe any number of things but for most people it is that idea of a video that somehow looks like it came out of Hollywood or at least from a major production. Since it began being bandied about in all its nebulous and undefined glory the marketing crowd have descended upon it like flies on poop. Use this LUT to get that cinematic look, use this effect to get that cinematic look, our camera shoots at 24 fps for that cinematic look on and on. So in answer to that check out the video below of an interview with Steven Soderburgh on using an iPhone to shoot his latest movie. The key takeaway from it is that the cinematic look is not the result on one factor be it video editing software or video capture device. It comes from a host of factors the first of which is having some clue as to what you are doing! I was alerted to the existence of this page a few days ago and it seems to have some great links for free green screen footage you can download and use in you projects. Fair warning here in that I have not personally checked all of them so I am not sure if any of them may require an email signup or whatever but worth taking a look at anyway. So there are two things I quite liked about the video below on the subject of travel videos. The first is that it is an excellent tutorial on how you can take some shots of just about any travel experience or holiday and creatively put them together into an entertaining video. This very much aligns with the concept I mention in the series on this site on making better videos of “representing” an activity in your videos rather than “documenting” those activities. The second point of interest in the video is the explanation of how the creator went from making the video to getting it shared around until ultimately was ably to leverage that into being paid to make travel videos. Believe it or not there are actually some rules to follow when it comes to adding text to a video… who knew! I am sure everyone at some point has hit upon a video where the addition of text started out as good idea based on the concept of adding clarity to the images and then… it all seemed to go downhill from there! It wasn’t all that long ago that at the consumer end of the market, video editing software began to add key framing as a feature. If you are unfamiliar with the term it is a pretty simple concept. Simply put it is the ability to place a “mark” or a series of “marks” at any given frame of a video you have loaded on to the timeline. The software can then use that mark to begin or end the application of some kind of effect, filter or adjustment to that video. Originally the implementation of key frames was pretty limited and generally speaking you were restricted to starting an effect at some point and then ending it at a later point. However these days key framing has evolved substantially and is far more sophisticated. Just about all those endless effects and filters you have loaded into your video editing software will be responsive to key framing. Now you can not only use key frame to start and end an effect but you can use multiple key frames to start an effect, have it get progressively stronger, have it reduce in effect and finally end. Possibly the one downside of key framing is that you really should have a plan before you begin to initiate anything too complex! One of the major drawbacks most people encounter now that we have not just high definition video at the consumer level but 2K and 4K high definition video as well is that all the pieces have not really fallen into place. As far as capturing this footage goes the devices we use and the cameras we have access to have this pretty much under control. However because there is the constant concern of having enough space at a consumer level in term of storage we are pretty much limited to creating MP4 files in some form or another. For the recording part this is not too much of a problem but when it comes to editing, things start to go off track rather quickly. The software most of us use truthfully is not really concerned about whether the footage is 1080p or 2K or 4K because they are all basically the same file but with larger specs. The real problems lie with our computers and unfortunately they have not kept up with development in the same way. The sheer computing power needed to handle high definition files is enormous and when you start to add transitions or filters or effects things start to go south in short order. Unfortunately for most people (because they are looking at the software on the screen) they get the idea that it is the software creating the problem and this sets them off on a search to find out why it is doing that or what is wrong with the software. This is totally understandable but at the same time sadly misguided and rarely results in a resolution to the problem. The real guilty party here is more often than not, the computer itself being unable to process and handle those huge amounts of data. Most video editing software makers are aware of this problem and offer a few strategies within them for handling the situation so as to provide a smoother editing experience. Check out the video below which is a demonstration of some strategies available within CyberLink PowerDirector. Don’t worry if you are not using PowerDirector, you will find that almost every video editing program out there these days has similar settings and strategies to deal with high definition files causing a rough editing experience. So if you are anything like me your comfort zone lies just about anywhere except for in front of the camera. That is a pretty unfortunate trait to exhibit if you are wanting to create presentation style videos and although a good old screen recording can get you out of the woods the bottom line is this. One characteristic that is predominant in the majority of cases when it comes to online video is that there is a human on screen presenting it. We humans just love to look at other humans and it is a pretty rare occurrence that a video will be successful without one… cute kittens excepted. The whole concept of presenting yourself on a video of course is a foreign concept to most of us but like most things in life there a few rules to observe, a few tricks to be learned and above all, you need to practice, practice, practice until the sight of yourself on camera is slightly less horrifying to you. In fact one of the best indicators that you are improving is when you see yourself on camera and are no longer physically ill at the sight of it.